Does endurance cycling help you live longer? Take one look at cycling legend Brian Robinson, and you may have your answer. Brian, aged 83, is a bona fide British cycling legend: the first Briton to finish the Tour de France in 1956 and the first to win a Tour stage in 1958. You can get a sense of just how good Robinson was from his victory in the 20th stage of the 1959 Tour de France, from Annecy to Chalon-sur-Saone. He finished the 126-mile (203km) etape a full 20 minutes ahead of the next rider - one of the biggest winning margins in the history of the Tour. There is some glorious black-and-white footage of the race highlights showing Brian raising his arms aloft as he crossed the line. There was plenty of time for him to pose for photos, kiss the local beauty queen, and perhaps have a spot of lunch before the rest of the riders showed up. Brian has passed on his passion for cycling to his 18-year-old grandson. Jake Womersley already has a sponsorship deal and hopes eventually to ride the Tour. "At the moment I do it simply for the love of racing," says Jake, "but looking at Granddad, I know it will keep me fit and healthy in years to come." Both men are understandably delighted by the prospect of the Tour de France coming to Yorkshire. The promotional body Welcome to Yorkshire, beat off competition from Scotland, Florence and Amsterdam to secure the first two stages of the 2014 Tour. Le Grand Depart will be in Leeds on 5 July, taking a 191-mile route to Harrogate. 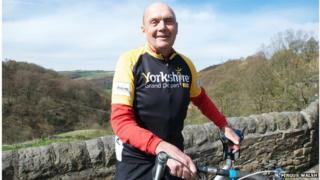 The second stage is 123 miles from York to Sheffield and will feature many of the hills that Brian Robinson trained on over the decades. The third stage is a 99-mile sprint from Cambridge to London. When the riders reach the Champs Elysees on 27 July, they will have ridden 2,272 miles in 21 days of cycling - making the Tour the most gruelling of all major sporting challenges. The elite riders are among the fittest individuals on the planet. But for every Chris Froome, Sir Bradley Wiggins and Mark Cavendish, there are thousands of amateur cyclists who dream of emulating their heroes. Many of these are what have become known as Mamils - middle-aged men in Lycra, riding bikes Brian Robinson could only have dreamed off when he was a professional. I confess to being one of them, although I have so far resisted the lure of a full-carbon dream machine. Last year I did the 130-mile Dragon Ride in Wales, taking in stunning scenery and quite a few decent hills. This year my target is the Prudential RideLondon-Surrey 100, a stunning route on closed roads - around the Surrey hills and finishing on the Mall in central London. After cycling with Brian and his grandson, my camera team filmed me making a rather slow ascent of Cragg Vale, one of the many hills that the Tour riders will tackle this year. It's not especially steep, but at more than five miles long, is reputed to be the longest continuous gradient in England. Those who are not road cyclists may often wonder why amateurs put themselves through the agony of climbing hills. I'm not sure I can answer that, except to say that when you get to the top, it feels like a kind of victory. So what is the evidence for cycling, and more specifically intense, endurance cycling, and health? The problem with most of the research is that they are observational studies, which can be confounded by other factors and so can show only an association between endurance cycling and longevity. One analysis compared 834 cyclists who rode the Tour de France from the 1930s-1960s and found that they lived, on average, eight years longer than the general population. Another study examined all 786 French competitors in the Tour from 1947-2012 and found they lived on average six years longer. Dr Xavier Jouven, of the European Georges Pompidou Hospital in Paris, who led the analysis, said: "We should encourage people to exert themselves. If there was a real danger in doing high-level exercise, then we should have observed it in this study." The better a patient's VO2 max, the more likely they are to do survive major surgery, and the quicker they recover. That study did find that the Tour riders were at higher risk of fatal traumatic injuries, no doubt as a result of cycling accidents. Also, many of the non-cycling people used for comparison in both studies will have had underlying health problems, so that may have skewed the findings. Some Danish research tried to get round this problem by comparing cyclists. For 18 years they tracked the health of 5,000 men and women who cycled every day in Copenhagen. They found that those who did intense cycling - enough to be out of breath - lived longer than those who simply pootled along at a pace where they could have a conversation. For men, the extra life expectancy was five years and for women, four years. While none of this is conclusive, it adds to the growing body of evidence that high-intensity exercise may yield significant long-term health benefits. This comes with the caveat that unfit, untrained individuals or those with underlying health problems should proceed with caution. One of the best measurements of cardiovascular health is the VO2 max test. This shows the maximum amount of oxygen your body can consume during exercise, so it involves being tested to the point of failure. As we age, heart muscle tends to stiffen, and so VO2 max will decline. The School of Sport and Exercise Sciences at the University of Kent compared trained cyclists with untrained but physically active individuals. They found that the older, trained cyclists were able to preserve much of their VO2 max and so delay the decline in their cardiovascular health. So while no-one can prevent the process of ageing, they can hold back the years. James Hopker, the lead author, said several hospitals were using a VO2 max test (called a CPET test) to assess patients' risk level for major surgery. He said: "The better a patient's VO2 max, the more likely they are to survive major surgery, and the quicker they recover." Perhaps foolishly, I was filmed having my VO2 max tested as part of my report on cycling and health. My score was 67.0 ml.kg.min - pretty good for my age. But the tests also showed that I have a power-to-weight ratio of just 5.04 W.kg.min, which apparently is not very good at all. It may explain why I climb slowly up the hills!